At The Rake Bar at the Borough Markets in London, some of the finest Irish breweries in the country will be showcasing some of their finest range of craft beers that they have to offer over the St Patricks Day weekend! 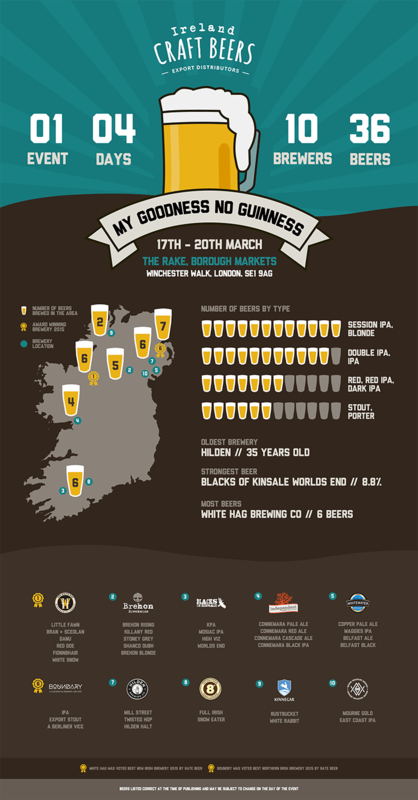 Check out the infographic below for more details and also the Facebook events page here, My Goodness, No Guinness. The Cage - 2-5pm - Blacks of Kinsale & Kinnegar Brewing - Beer chat with the breweries and some beer tastings. The Rake - Starting from 6pm, Blacks of Kinsale, White Hag Brewing & Kinnegar brewing will all be there to have a chat, raffle off some prizes and of course do some beer tasting! The Cage - 2-5pm - Samples and chatting about the beer with White Hag Brewing. The Rake - From 6pm, White Hag brewing will be there to ask questions about their beer, give away prizes and do some beer tasting! *Please note times and breweries atending may be subject to change on the day of the event.